Google apparently doesn’t mind picking a fight with China. In 2010, unable to find a basis in which it could operate its services with minimal filtering or interference, and after attacks reported to originate in China against the company’s internal mail and other systems, it shifted its search results from mainland China to servers in Hong Kong. Hong Kong operates under a special status, though it is part of the People’s Republic. Mainland searchers had to use workarounds to perform searches via Google in Hong Kong and elsewhere. Google’s primary source of revenue is selling advertising next to search results; its secondary sources including the sale of apps and media in Google Play, business services (like Google Apps for Work), and video advertising embedded in YouTube. It can deliver these digital services from anywhere in the world to anywhere in the world—unless blocked. The Internet requires trust, whether you want to believe that or not. Most traffic on the Internet still passes in the clear through data centers and within and across national boundaries. An increasing percentage is encrypted. An ever-larger part of that is protected in such a way that even the companies making the software can’t peek within what’s being sent and read your messages or see your photos. This has annoyed the FBI, the prime minister of the United Kingdom, and authorities in many other countries. Google sounded the alarm March 23 about what turned out to be the egregiously bad idea of Chinese domain registrar and CA, CNNIC, to pass on authority for its root certificate—the secret encryption material used to countersign any certificate it issues—to a reseller for an ostensibly benign or limited purpose. Within days, Mozilla and Google had investigated, removed the reseller’s intermediate authority, and kicked CNNIC out of the root list of CAs for all their products: Android (OS), Chrome, Chrome OS, Firefox, Firefox OS, and Thunderbird, to name the marquee items. Mozilla said it would keep older certificates valid given provisos that don’t seem to have been met; Google said all CNNIC-signed certificates would become invalid.) Both organizations say they’d consider adding CNNIC back in, probably with additional safeguards in place. Mozilla discusses these issues publicly among its community. 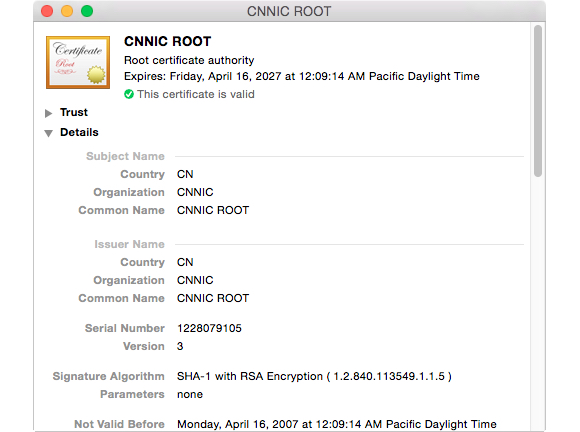 CNNIC’s root certificate remains in Apple’s trusted set in OS X.
Microsoft doesn’t break out its Chinese or Asian sales, estimated to be just a few percentage points of its total revenue. But it has strived for years to increase sales there, and the future of Microsoft in versatile devices and cloud services means it has to bump sales in China. While these rules apply to the banking industry, and haven’t been put into enforcement yet, pressure apparently exists across many industries for the same sorts of requirements, partly to turn purchases to Chinese firms that will have no choice but agree to the conditions. Apple failing to boot CNNIC and failing to discuss its reasoning for not doing so isn’t a minor point when hundreds of millions of computers and devices are affected by its decision, and two other firms—one a competitor and one not really in the same business or in any real business at all—with different constraints in China acted quickly and publicly. 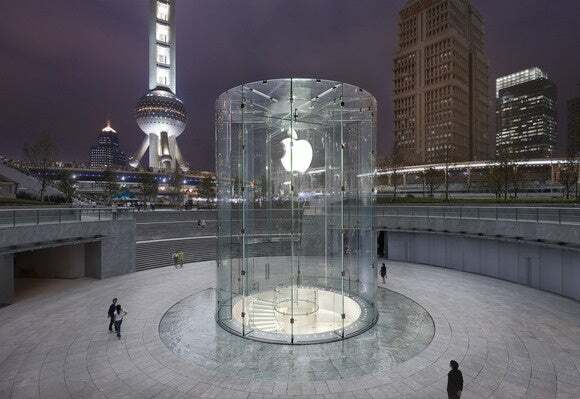 The importance of China to Apple’s continued growth can’t be understated. This is why they should be held to just as high a standard of disclosure about issues affecting security there, as they are when Tim Cook bucks the FBI and NSA.